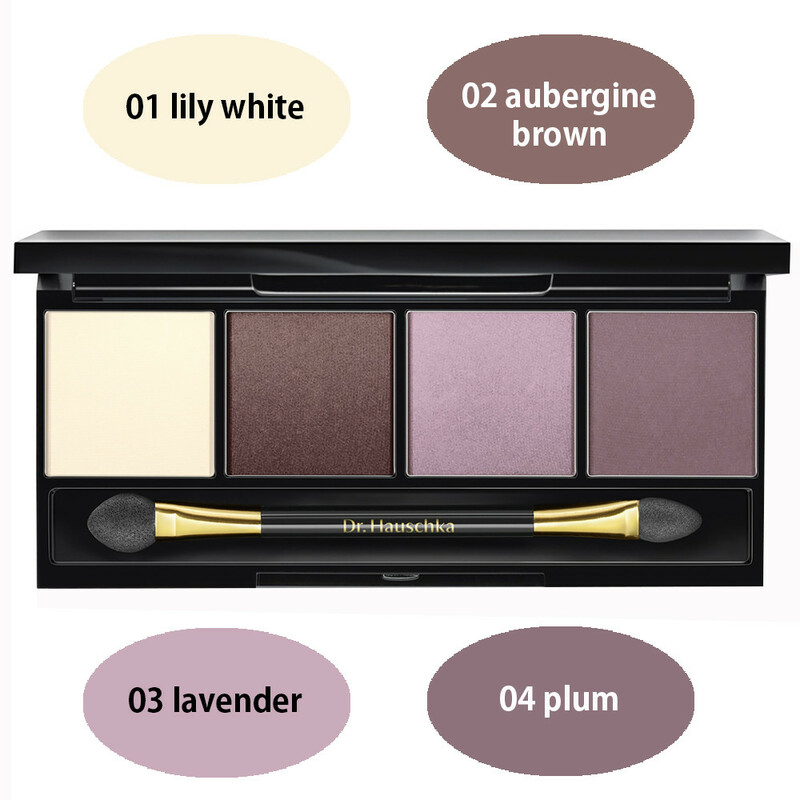 The four harmoniously combined shades of violet are perfect for creating expressive eye make-up. The formulation with mineral pigments and medicinal plant extracts, especially of black tea, as well as silk makes the eyes shine brightly. Ingredients 01 (lily white): Talc, Mica, Magnesium Stearate, Caprylic/Capric Triglyceride, Silk (Serica) Powder, Diatomaceous Earth (Solum Diatomeae), Silica, Anthyllis Vulneraria Extract, Hamamelis Virginiana (Witch Hazel) Bark/Leaf Extract, Camellia Sinensis Leaf Extract, Fragrance (Parfum), Citronellol*, Geraniol*, Linalool*, Citral*, Eugenol*, Tin Oxide, Iron Oxides (CI 77491), Titanium Dioxide (CI 77891). Ingredients 02 (aubergine brown), 03 (lavender): Talc, Magnesium Stearate, Caprylic/Capric Triglyceride, Silk (Serica) Powder, Diatomaceous Earth (Solum Diatomeae), Silica, Anthyllis Vulneraria Extract, Hamamelis Virginiana (Witch Hazel) Bark/Leaf Extract, Camellia Sinensis Leaf Extract, Fragrance (Parfum), Citronellol*, Geraniol*, Linalool*, Citral*, Eugenol*. [May contain (+/-) Mica, Iron Oxides (CI 77491, CI 77492, CI 77499), Titanium Dioxide (CI 77891), Ultramarines (CI 77007)]. Ingredients 04 (plum): Talc, Mica, Magnesium Stearate, Caprylic/Capric Triglyceride, Silk (Serica) Powder, Diatomaceous Earth (Solum Diatomeae), Silica, Anthyllis Vulneraria Extract, Hamamelis Virginiana (Witch Hazel) Bark/Leaf Extract, Camellia Sinensis Leaf Extract, Fragrance (Parfum), Citronellol*, Geraniol*, Linalool*, Citral*, Eugenol*, Maltodextrin, Carmine (CI 75470), Iron Oxides (CI 77491, CI 77499), Titanium Dioxide (CI 77891).